Researchers have discovered an unusual bacterial protein that attaches to virtually any antibody and prevents it from binding to its target. Protein M, as it is called, probably helps some bacteria evade the immune response and establish long-term infections. If follow-up studies confirm Protein M's ability to defeat the antibody response, it is likely to become a target of new antibacterial therapies. The protein's unique ability to bind generally to antibodies also should make it a valuable tool for research and drug development. "What Protein M does to antibodies represents a very clever trick of evolution," said Richard A. Lerner, MD, Lita Annenberg Hazen Professor of Immunochemistry and Institute Professor at The Scripps Research Institute (TSRI), who led the research. To better understand this process, the team investigated mycoplasma, a parasite that infects people chronically and is largely confined to the surface of cells. In a search for factors associated with long-term mycoplasma infection, Rajesh Grover, PhD, a senior staff scientist in the Lerner laboratory, tested samples of antibodies from multiple myeloma patients' blood against a variety of mycoplasma species. One of the proteins recognized by the antibodies was from Mycoplasma genitalium, which causes sexually transmitted infections in humans. To the scientists' surprise, every antibody sample tested showed reactivity to this protein. But further tests made clear that these antibody reactions were not in response to mass infection with M. genitalium. Instead, the scientists found, the mysterious M. genitalium protein appeared to have evolved simply to bind to any antibody it encounters. A team led by scientists at the Scripps Research Institute has discovered an unusual bacterial protein that -- to the scientists' surprise -- attaches to virtually any antibody, possibly helping bacteria establish long-term infections. Compared to thousands of known structures, this protein appears to be unique. The current research suggested that M. genitalium has evolved such a decoy. "It binds to every antibody generically—capable of hijacking the entire diversity of antibody repertoire—but at the same time it blocks the specific interaction between that antibody and its intended biomolecular target," said Grover. The team decided to call it "Protein M."
To better how understand Protein M works, Xueyong Zhu, PhD, a staff scientist in the laboratory of Ian Wilson, DPhil, Hansen Professor of Structural Biology and chair of the Department of Integrative Structural and Computational Biology at TSRI, and colleagues took a structural biology approach. 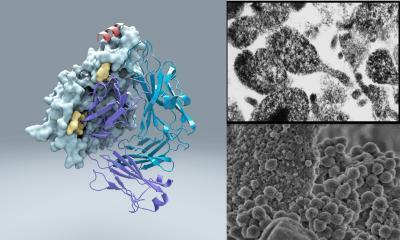 Using X-ray crystallography and other techniques, including electron microscopy in the TSRI lab of Assistant Professor Andrew Ward, PhD, the team determined the protein's 3D atomic structure while the protein was bound to various human antibodies. The data also revealed that Protein M binds to a small, unchanging—"conserved"—region at the outer tip of every antibody's antigen-binding arm. "It likely extends the other end of itself, like a tail, over the antibody's main antigen-binding region," Zhu said. The team is now studying Protein M's function during M. genitalium infections. It seems likely that the oddball protein evolved to help M. genitalium cope with the immune response despite having one of the smallest bacterial genomes in nature. "It appears to represent an elegant evolutionary solution to the special problem that mycoplasma have in evading the adaptive immune system," said Grover. "The smallest parasitic bacteria on planet earth seems to have evolved the most sophisticated invading molecular machine." In the era of antibody-based drugs, the most immediate use of Protein M is likely to be as a tool for grabbing antibodies in test tubes and cell cultures, useful for the preparation of highly pure antibody for research and drug manufacturing. Other generic antibody-binding proteins have been put to use in this way, but so far it appears that none does the job quite as well as Protein M. "It may be the most useful antibody purification device ever found," said Lerner, who is already in talks with industry to commercialize the protein.